In 1940, the NAACP formed the Legal Defense and Educational Fund, Inc. (LDF) to ensure that money donated for legal cases remained tax deductible. Marshall became its first Director-Counsel. 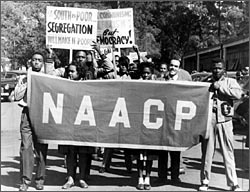 Until 1957, the NAACP and LDF shared staff, space and other resources. This meant that Marshall often worked closely with - or at least in proximity to - Walter White, the Executive Secretary of the NAACP. When it came to raising money and appealing to the nation's conscience to end racial injustice, White and Marshall made a powerful pair. But they also sparred sometimes, as Marshall recalls here. Marshall: Walter White was the front man. He went out. He met with the president [of the United States]. He did this, he made that public statement and all - we went along. Roy [Wilkins] was the one that actually ran the organization, the day-by-day nuts and bolts, Roy ran that. And I had the legal side. But at times, the real problem would come up because Walter White always thought he was a lawyer, and he would interfere with my legal business, and he'd get his head chopped off because I didn't believe in letting laymen tell me what I had to do. So that's what the usual fights would be. He would come into the Supreme Court and sit in the lawyers' section. Everybody thought he was a lawyer. And one time I told him, I said, "Now, look - you're not supposed to be in there, and they know you're connected with me, and one of these days, they're going to find out you're not a lawyer, and I'm going to get blamed for it. And it's going to affect my standing, and I don't believe in letting anything affect my standing in the Supreme Court. So I'm telling you, don't let me catch you sitting in there again. If you do, I'm going to tell the guard." And he said, "You wouldn't!" And the next case that I was arguing, I kept looking around, and I didn't see Walter sitting there, so I thought I won. And I had to look over [at] the judge's box-he was over there. He had gone to Hugo Black and gotten Hugo Black to put him in the box. So he won anyhow. Well, it was nothing serious.